As an ambitious pro drummer, you know that anything less than the ultimate sound and feel will hold you back. 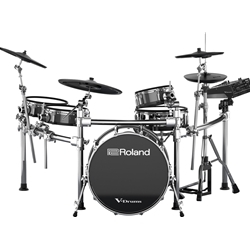 Introducing the Roland TD-50KV, the flagship in the acclaimed V-Drums range, created for top-flight live performance, intense practice sessions, and eclectic studio work. Built on the foundation of the new TD-50 module with Prismatic Sound Modeling, this electronic kit provides Roland’s most impressive and wide-ranging sounds yet. The advanced processor is complemented by newly developed snare and ride pads, which feature multi-element sensor systems and high-speed digital communication with the module. The kit also includes top-line tom, crash, and hi-hat pads, and the module provides deep editing features and flexible connectivity to put you in charge. And as an alternative to the included KD-140-BC kick, you have the option of mounting a KD-A22 Kick Drum Converter on your favorite 22-inch acoustic kick for powerful hybrid performance and big stage presence. Offering supreme playability and unmatched expression, the TD-50KV and KD-A22 deliver the most impactful live V-Drums experience ever. * Model shown is TD-50KV with optional KD-A22. The KD-A22 is sold separately. 22-inch acoustic bass drum shell not included. * Kick pedal, snare stand, hi-hat stand, and drum throne are not included. CALL US FOR BEST PRICING!! !